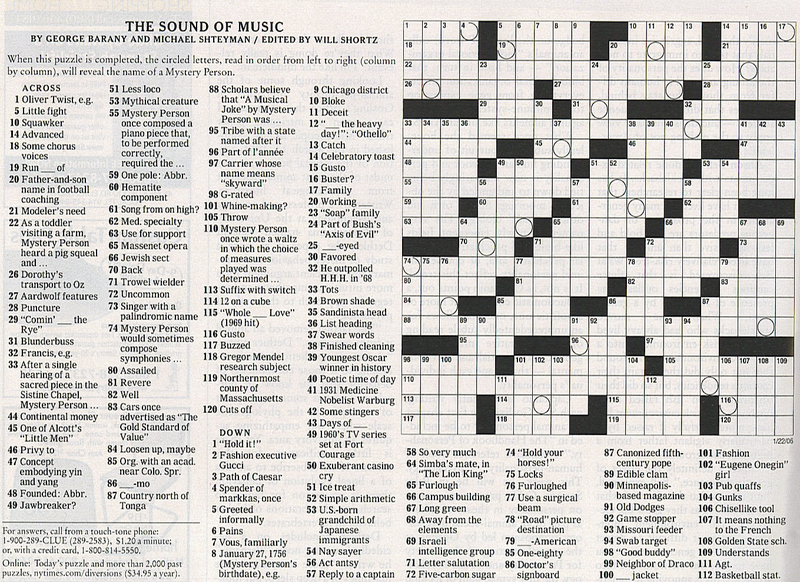 This crossword puzzle was published in the January 22, 2006 (Sunday) New York Times. Note: When the puzzle is completed, the circled letters, read in order from left to right (column by column), will reveal the name of the puzzle's honoree. After completing the puzzle (spoiler), click here and here to read newspaper/magazine articles about the publication of the puzzle that include interviews with Professor Barany, and here or here to listen to a radio interview (associated text here). To view or download the puzzle in in PDF format, click here (two pages) or here (one page, for those with good eyesight) or here (scanned from the actual newspaper); here to download it as a puz file; here to download it as an ipuz file [requires the free Puzzazz app to solve]; and click here to solve the puzzle interactively (thanks to Jim Horne). See the solution here, or an animated solution here. More puzzles here (all), here (music), and here (tributes).